This Raspberry Crisp Recipe makes an amazing fresh fruit crisp with a golden oatmeal topping ... it's sure to take your taste buds for a trip! I made this dessert crisp using red raspberries, but, of course you can use yellow, purple, wild or black raspberries instead! Or, use a variety of raspberry types! You can make this crisp recipe in a 9" square baking dish, or into two smaller dishes equalling about the same size. 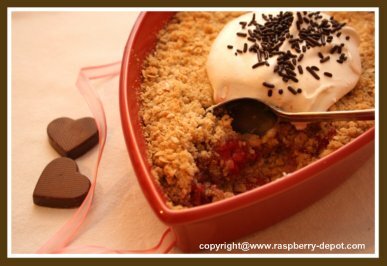 I made this Raspberry Crisp Recipe for Valentine's Day. 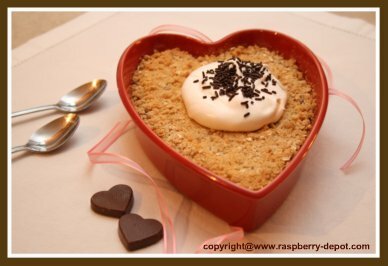 I used half of the ingredients and made it in a cute Heart Shaped Dish, for Two to Share! Of course it's a most scrumptious dessert dish to make for ANY time of the year! Crush 1 cup raspberries, and add enough water to measure 1 full cup. In a saucepan, combine the sugar and cornstarch, then stir in the raspberries (above) and stir just to combine. Bring the above mixture to a boil, cook and stir for 2 minutes or until thickened. Remove from heat, and stir in the remaining raspberries, just to combine. Cool. In a bowl, combine the oats, flour, brown sugar and baking soda. Press half of the crumbs into a greased 9" square baking dish. Spread with cooled berry mixture. Bake at 350° F for 25 - 30 minutes or until top is lightly browned. Enjoy this Homemade Raspberry Dessert Recipe! ~~ This fruit crisp freezes really well too, so you can even make it, freeze it, and then you have it on hand for whenever you need to serve something VERY DELICIOUS!